- (6) Main stations on an area of 900:1600m2 for each, discharge for each ranging from 55:130 liter /sec . - (3) Sub-stations on area of 900 m2 for each, discharge for each ranging from 28.5: 67 liter /sec . Clay pipes of diameters (7": 36 ") & length (146 km). Ductile Cast iron pipes of diameters (300, 400, 500mm) & length (24.15 km). - (2) Tunnel crossings below the railway, diameters (2.25, 1.8 m) & lengths (54.6,37m). - (1) Tunnel crossing below Shebin El-Koum Sea , diameter (2.25 m) & length (56m). 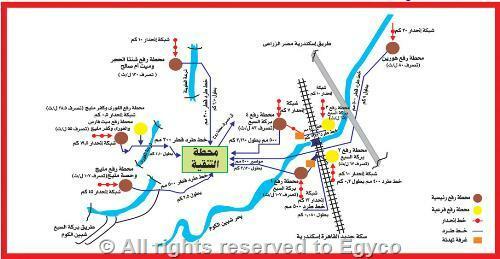 - (1) Tunnel crossing below Misr/Alex Agricultural Road, diameter (2.25 m) & length (66m). - (1) Uncovered excavation cast iron gravity crossing, diameter (500 mm) & length (24 m).